Most salespeople will eventually receive a business email from someone they don’t know. When that happens, tracing an email, also known as reverse email lookup, can provide additional context. Fortunately, there are several tricks and tools you can use to check an email address’ owner, and we’ve evaluated the best five overall. However, more often the challenge is identifying email addresses for unknown prospects and target accounts. Findemails.com is an email list service with verification that allows users to purchase validated email lists, but it also offers the ability to validate individual emails. The service then provides users with a name, company, and other profile information with a starting price of $19 per month for 500 email credits. Visit its website for more details. There are several reasons that a salesperson might want to do a reverse email lookup or check an email address owner. For example, you may have received an email inquiry from someone you are not familiar with at all, and you want to know more about the prospect before you reply. 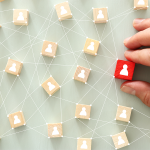 You may also have a contact in your lead database that you want to connect with, and you are looking to add information about where they work, their role, or mutual connections. Reverse email lookup shows prospective customers that you’ve taken the time to do your homework. In addition, matching the email up to an individual can help you recognize known contacts whose email addresses have changed as a result of a business acquisition or reorganization and, therefore, reduce the risk of duplicate records in your contact database. However, no one method of reverse email lookup is completely foolproof, which is why we have compiled a list of several methods you can use to ensure you are getting the most amount of information possible when conducting a reverse email lookup. To test each of these methods, we randomly selected 15 email addresses from an opt-in subscriber list that only asked for an email address. We then tested the accuracy of each method by comparing what information we could discover using only an email address. To determine the best, we recorded the results as well as the pros and cons discovered during our evaluation. One of the most basic ways to lookup an email address is to search using Google by entering the email address in the search bar. While this isn’t the most reliable method, Google will provide results if the email address is listed on a search-engine indexed website. Work email addresses are more likely to be found this way since it’s more likely that they are listed in an online directory or company website. Searching on Google is more likely to produce results if you are looking to check the email address owner of a business email since it is more likely to appear in context on a company directory or contact page. 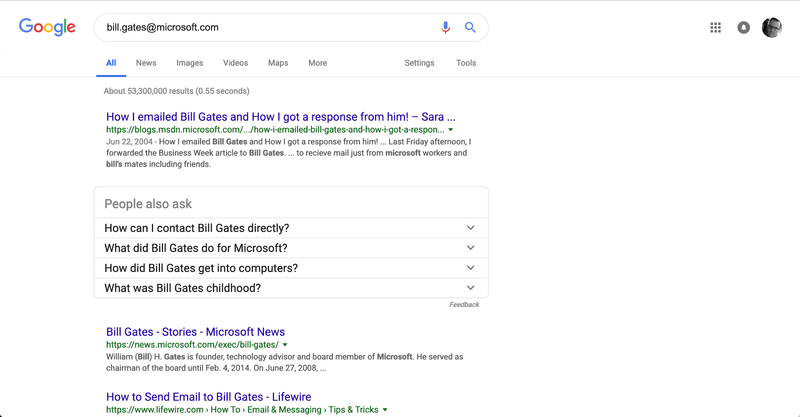 While Google is the most popular search engine, you might sometimes find additional results by entering the email address in the search bar of Duck Duck Go, or Bing. Of the email addresses that we randomly selected, 2/15 owners were identified with Google. In both of those cases, it was because the email address was listed on a business website that the person owned. In one additional case, Google directed us to a people search website but wasn’t able to provide direct results without us signing up for a third-party service. However, searching on Google is a quick and free way to get started. One of the biggest advantages of starting with Google is that it’s free and can provide you with the information you are looking for quickly if your contact uses their email address on their website. While it is the least likely to produce results for personal email addresses or for individuals at large corporations, it can provide a place to start your research on new prospects, especially sole proprietors who use their email address as their primary contact on their website. In some cases, you use an email address to search for a social media network to attempt to identify the owner. To do this, enter the email address into the search feature found on most social networks. For example, if a user has made their email address publicly available on their timeline, Facebook allows you to search by that email. By default, most users’ contact information is private, so this only works if they’ve opted into sharing their email address. While Twitter and LinkedIn also include search features, they are less reliable when trying to search by email. To search using Facebook, log into your profile and enter the email address you want to identify in the search box in the upper left. 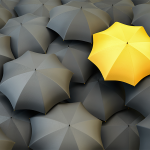 Any profile, post, or page that is associated with that email will then appear in the results. You can click on the profile, or post to get more information, and can choose to follow the person or Like the page. We were only able to locate 3/15 of the email owners using Facebook. Unfortunately, because neither of the other two were Facebook friend connections, the information Facebook was willing to share was limited due to its privacy settings. However, we were able to find a name. This was useful, but this method is best when you can leverage other social media connections for additional insights. When there is an established or shared connection, a reverse email lookup on Facebook will provide information like friends, job title, and location. However, even if there is no direct connection, searching using this method can help identifying mutual contacts, which you can then reach out to request an introduction. Most social networks have made it more difficult to search for contact profiles by email unless the individual has specifically opted to make their email address public. However, this can be another quick way to gain insight into your contact. One particular advantage is that it can provide you with information about mutual connections, which can then be used to request an introduction if you are researching a prospect. In many cases, customer relationship management (CRM) software can auto-enrich profiles with publicly available information. If you have leads that are entered into your database with only an email address, some CRMs can identify social networks associated with that email and can help you locate a name. Freshsales, for example, will automatically search for Facebook, Twitter, and LinkedIn profiles associated with the email address of your contacts. Freshsales offers a free-forever plan, as well as tiered pricing plans beginning at $12 per month per user including contact management, profile enrichment, and sales pipelines. Visit Freshsales today to start your 30-day free trial. The results, in this case, were skewed because the email addresses came from an existing marketing list, though none of them had been added to our Freshsales account. By entering the email addresses alone, we were able to identify the email owner for 6/15 of the email addresses. Freshsales provided information that included social media links and provided additional contact information like company and name. Since your contact information already lives in your CRM, it can be an efficient way to gain insight and additional context about your prospect. At the same time, many CRMs charge more for plans with these capabilities, making it a more expensive way to find out more about the owner of a specific email address. Another option for Google Chrome users is to use browser extensions that identify sender information automatically. For example, FullContact has a Chrome extension for Gmail that users can install that provides contact information for email addresses automatically when viewed in Gmail. When users receive an email, FullContact gives additional information like company, title, social media, and phone number automatically, using a sidebar in Gmail. In addition to a browser extension, FullContact includes a web and application programming interface (API)-based dashboard that provides robust contact information that you can use to identify contacts by email address. 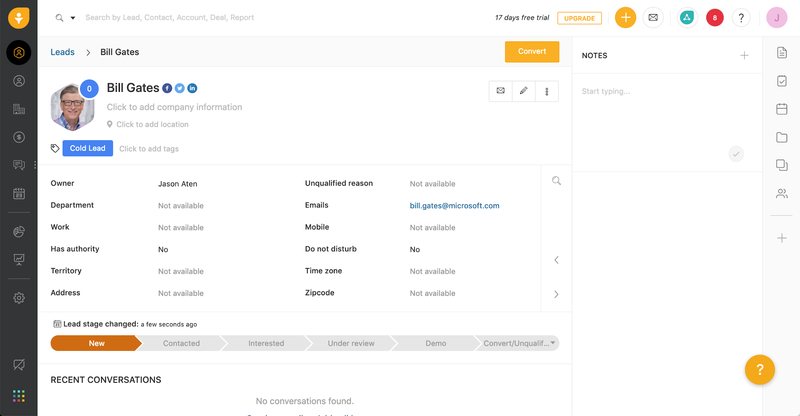 This allows users to search FullContact directly as well as create API connections with other software tools to add additional contact information. Using FullContact, we were able to identify the owner of 13/15 test emails. FullContact provided a name, social media profile links, and in some cases provided a short bio, affinities, work history, and profile photos. In addition, FullContact can search LinkedIn, which users are not able to do directly in LinkedIn itself. Another advantage of FullContact is that because it works as a Gmail plugin, you’re often able to locate information without leaving your inbox. Because FullContact lives inside of your Gmail inbox, it is a simple and efficient way to show additional information about the sender of an email address. It’s also flexible enough to be useful as a standalone search when all you have is an email address, and you want to know more about their professional and demographic information. Because the higher-quality API search features require a subscription, it also can be expensive for occasional searches. A final option is to use a paid service like Spokeo. 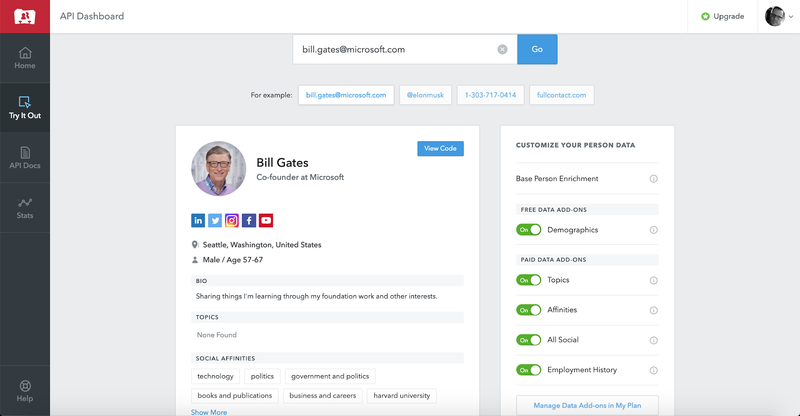 Spokeo is a search engine that aggregates white pages, public records, and social media network information into contact profiles that users can search by name, email, social media handle, and even phone number. Spokeo returns any results associated with the information you provide and gives you the ability to view address history, work history, connected social media profiles, and even relatives. Spokeo charges $11.99 per month but can locate extensive information based on the vast network of information it searches. 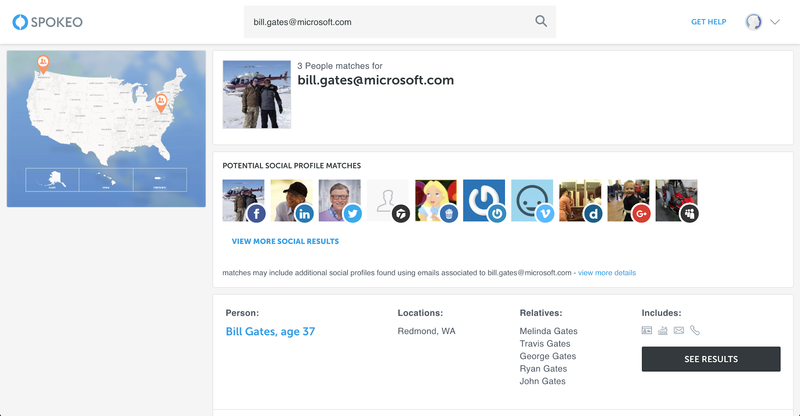 For users who need reliable contact search capabilities including reverse email lookup, Spokeo may be a worthwhile investment. This service can be especially helpful for sales professionals who collect a lot of emails and want to reach out and make personal contact. Spokeo was able to identify the owner of 14 of the 15 test emails, making it the most effective for this test, although in some cases it produced multiple possible results. This required us to do a little deduction to determine which was the correct record. However, Spokeo provided names, home addresses, employment history, relatives, and even makes court records information available at an additional cost. Since Spokeo provides a variety of types of data including information about current and past addresses, relationships, work history, and background checks, it is certainly one of the more comprehensive ways to gain insight into the owner of an email address. It also lets you search by other criteria like home address, phone number or social media handle. At the same time, it is a paid service, and the background and social connections require additional fees. Reverse email tools can be a powerful tool, especially for sales and marketing professionals as well as any business that collects email addresses. Knowing a few ways to check email address owners can give you the information you need to connect and build a relationship. Using these five ways to trace email addresses can help you improve your lead generation process and communications. One additional option to consider for better sales emails is to use a service like Findemails.com. Findemails.com is an email list service with verification that allows users to purchase validated email lists. It also offers the ability to validate individual emails and provides users with a name, company, and other profile information similar to FullContact or Spokeo. Findemails.com starts at $19 per month for 500 email credits. Visit its website for more details.